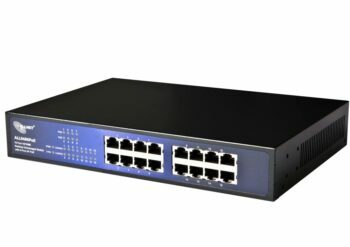 Fanless Unmanaged Layer-2 Switch with 16 Fast Ethernet ports RJ45 and 8 ports with maximum Power over Ethernet support of 15.4 Watt on all 8 ports. 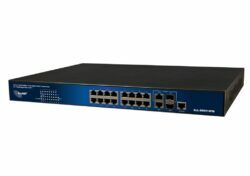 The ALL0486PoE provides the optimum basis for supplying up to 8 PoE devices (Port 1-8) with network and power via the same cable. The switch automatically detects whether a PoE device is connected and what voltage the device requires. 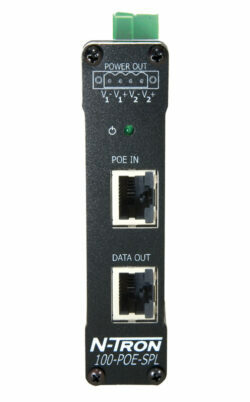 Here, the maximum possible PoE power of 15.4 watts is available on 8 ports simultaneously. 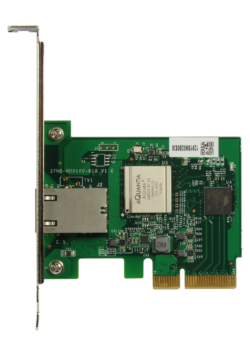 If a device is connected which has no PoE support, the ALL0486PoE detects this and no voltage is applied, thus protecting the device from damage. The ALL0486PoE has a robust metal housing. It is also 19” mountable, so that it can be installed in any standard server rack. The eight RJ45 network ports automatically detect the transfer rate of the connected devices (10 or 100Mbit/s). Due to full- and half-duplex operation, a maximum of 100 Mbps per port is available.